Cooking Light magazine hosts an annual Ultimate Reader Recipe Cook Off. 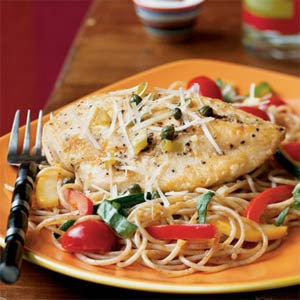 I was a 2005 finalist in the entree category with this light version of chicken piccata. If light cooking isn't your goal, and you want the dish to be a little more decadent, you can always increase the butter by a little. It's actually wonderful as is, in its healthful, hearty, and low fat state. Although this recipe calls for vegetables that are inexpensive and readily available in the summer, it would be equally good with other seasonal vegetables, like asparagus in the spring, or squash in the fall. Feel free to adjust. Here's a dinner that the whole family can feel good about, and there will be PLENTY left over for a yummy lunch tomorrow. Preparation: Heat a large nonstick skillet over medium-high heat. Coat pan with cooking spray. Add bell pepper and onion; sauté 8 minutes or until tender and beginning to brown. Place onion mixture in a large bowl; keep warm. Return pan to medium-high heat. Recoat pan with cooking spray. Add zucchini and yellow squash; sauté 4 minutes or until crisp-tender. Add tomatoes and garlic; sauté 2 minutes. Add squash mixture to reserved onion mixture. Keep warm. Cook pasta according to package directions, omitting salt and fat. Drain pasta in a colander over a bowl, reserving 1/2 cup cooking liquid. Add pasta and reserved cooking liquid to vegetable mixture, stirring to combine. Add 1/2 cup Parmesan cheese and basil; toss to combine. Keep warm. Sprinkle both sides of chicken with salt and 1/4 teaspoon black pepper. Place the flour in a shallow bowl. Dredge chicken in flour, turning to coat; shake off excess flour. Heat a large nonstick skillet over medium-high heat. Coat the pan with cooking spray. Add olive oil to pan, swirling to coat. Add chicken, and cook 4 minutes on each side or until done. Remove from pan; keep warm. Add broth, juice, and capers to pan, scraping pan to loosen browned bits. Bring to a boil; cook 3 minutes. Remove from heat. Add green onions, butter, and remaining 1/4 teaspoon black pepper; stir until butter melts. Arrange about 1 cup pasta mixture on each of 4 plates; top each serving with 1 chicken breast half, 1/4 cup sauce, and 1 tablespoon remaining cheese. Serve immediately.